Want to create FM8 Dubstep Leads? FM8 is a great tool for creating robotic leads and deep growls which are extensively used in dubstep and other bass heavy dance music. In this FM8 Dubstep tutorial we will make heavy a dubstep lead which we will animate through the use of FM8’s great morphing feature and a few other great tricks. The key ingredient for such sounds is movement, drastic changes in timbre and low, ground shaking frequencies. First enable operator F. It will act as our main carrier operator. Leave the ratio at value 1 for now. Raise the attack value of the envelope to 0.2 and release to 0.08 to get rid of the nasty click at the end of our sound. Set the self oscillation value to 23 so we get some harmonic content in our waveform. We will also use this oscillator as a carrier but also as a modulator at the same time. Enable audio output of the oscillator D and drag the volume just above the 90 percent. Change the waveform to triangle wave and set the self oscillation amount to a value of 46. You should now hear a bass like tone which will act as our foundation for the sound. Drag the attack of the envelope to 0.42. Set the self oscillation to the value of 10. Set the D operator to modulate the E operator with its full amount. And then E to F to about 60. Now we have something which resembles the typical lead sound in dubstep music. But we are not there yet. We need to add some movement to the sound as well as some effects to further shape our sound. 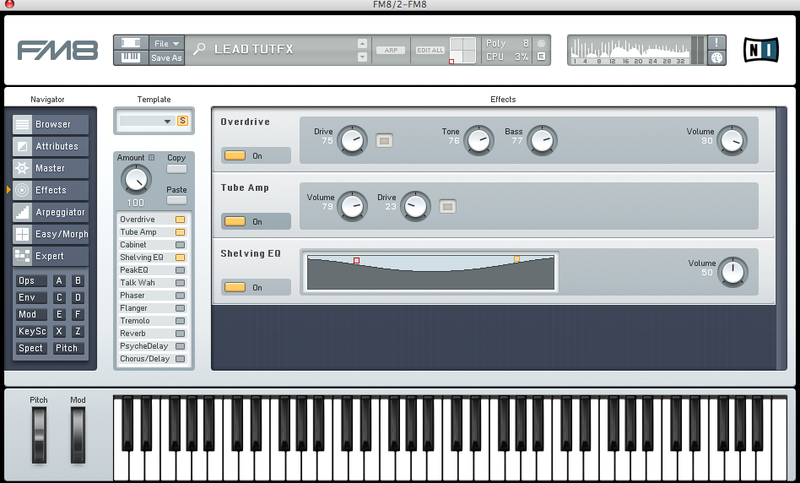 Go to the effects section of our synth. Turn on overdrive effect and set the drive parameter to 75, tone to 76, bass to 77, volume to 90. Next, enable the tube amp effect and set the volume to 79 and drive to 23. Also enable shelving EQ and boost the low and high frequencies like in the picture. We also have to add some modulation to our sound. Go to the mod section and enable LFO 1 to modulate the amplitude of oscillator E via modulation wheel like this. Set amount to 100. 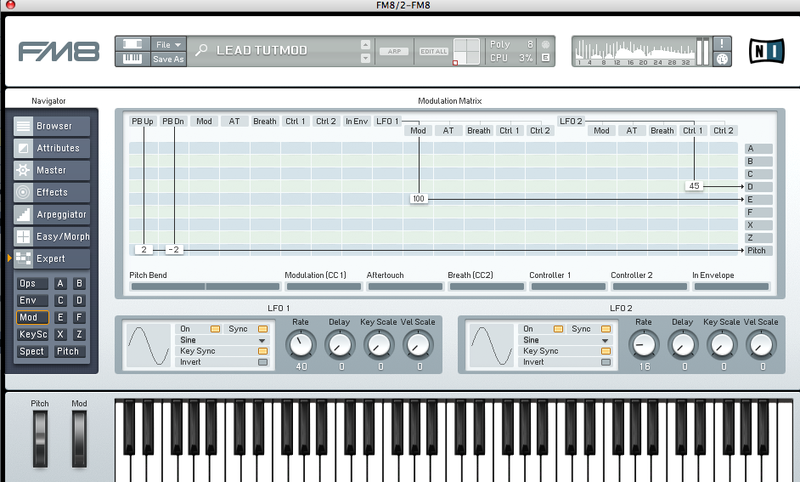 The second LFO 2 will modulate amplitude of operator D via ctrl 1. Set amount to 45. On the both of LFOs chose sine wave, enable sync so LFOs will be synced to host clock and also enable Key Sync which will restart our two LFOs with every new note played. In order to animate our sound we will use the the FM8 morph square. First of all we have to normalize our timbre which loads our current operators configuration into all four corners of a morph square. Start changing the operator modulation amounts as well as operator ratios. 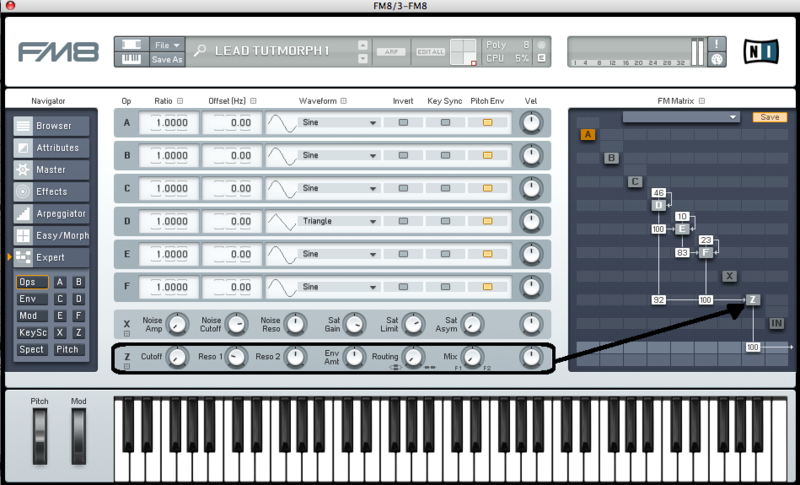 The LFO section can not be morphed so you should also tweak them along to see how it affects your new sounds. There are no rules really and it highly depends on your personal preferences. Also, when you turn up the ratio the sound will get higher in pitch and you can compensate this by lowering the volume of that certain operator or lowering the modulation amount. You can also change the ratios to non-integer numbers which will drastically change the timbre to more non harmonic sounds which works great for fills and short crazy sounding parts. Also, you can change the waveforms of a certain operator but remember you cannot morph between them smoothly. Just experiment with those parameters and you will end up with four different sounds for each corner. Another two highly suitable parameters to tweak are found in the master section of the synth. They are called analog and digital. Analog parameter introduces the slight random pitch variations in sound which makes it sound more like old analogue synthesizer while digital parameter introduces the effect similar to sample rate reduction which is more than just suitable for our lead. 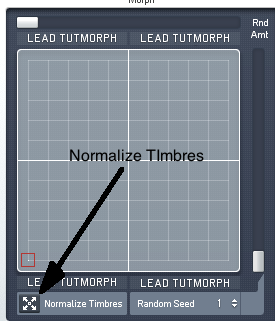 Since this two parameters can also be morphed, adjust these two parameter for each of the morph square section. As you may noticed I didn’t use any filters in this patch as fm synthesis technique doesn’t really require one. But if you want you can easily make those standard low pass filter wobbles in FM8 also. Just enable Z operator which is FM8 filter module. Set routing to parallel, set mix parameter all the way to filter 1 and cutoff to zero. Turn off the audio outputs of both carriers and route them in to Z module like the one in the picture. Now all we have to do is to route LFO1 to filter cutoff. Go to the mod page and assign LFO1 via the mod wheel to module Z. Here we go, now you can control the amount of filter wobble with modulation wheel. Optionally you can also add the amazing Talk wah effect found in the FM8 effect section. 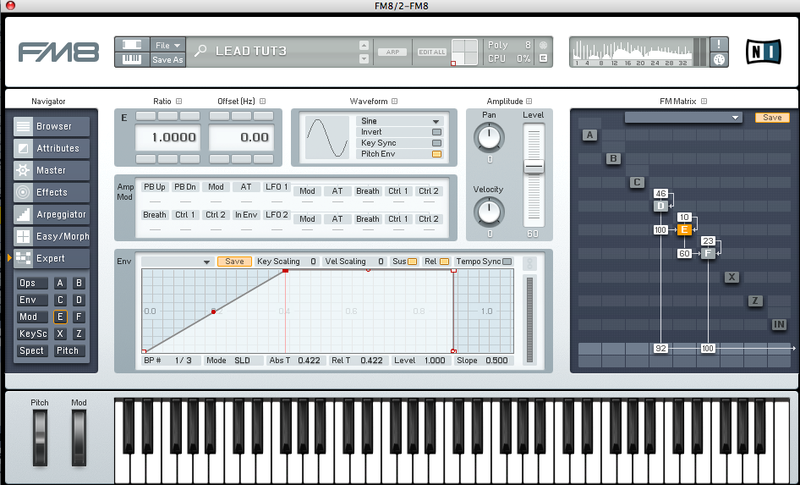 With this you can introduce those vowel sweeps which are really popular in dubstep. Just assign the effect and change the value of the Mouth parameter and here you have your own personal monster screams. 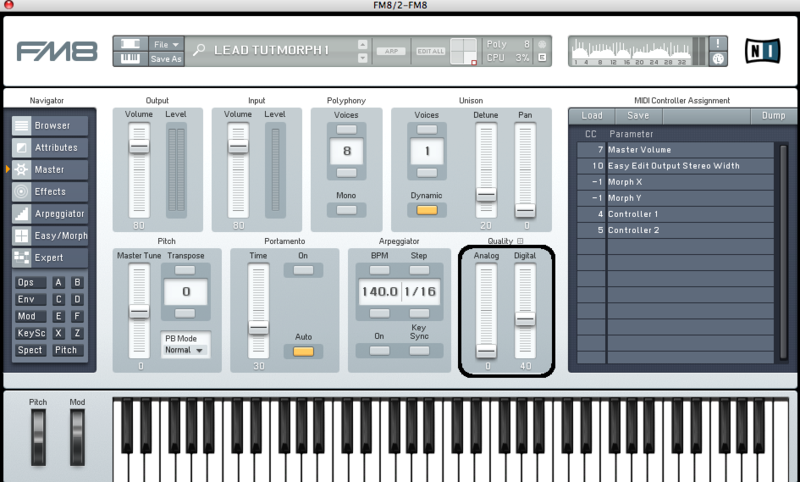 All you have to do now is to play a few low notes and morph through various morphing configurations you have made. Make a few different versions of your patch and your leads will never get boring again. In order to get the best results you should use some EQ to further shape the sound as well as compressor to smooth out the volume drops caused by drastic timbre changes. Also I think the re-sampling technique is crucial to get industry standard leads and bass sounds in dubstep because it offers more control over the sequencing part and also in terms of timbre manipulation and overall sound design aspect of the process. Have fun with your FM8 Dubstep Leads!